The 165th Transportation Company was constituted into the US Army as the 165th Quartermaster Company and activated at Fort Ord, California, on 23 April 1942 and subsequently the 165th Quartermaster Company was inactivated at Ford Ord, California on 8 July 1942. 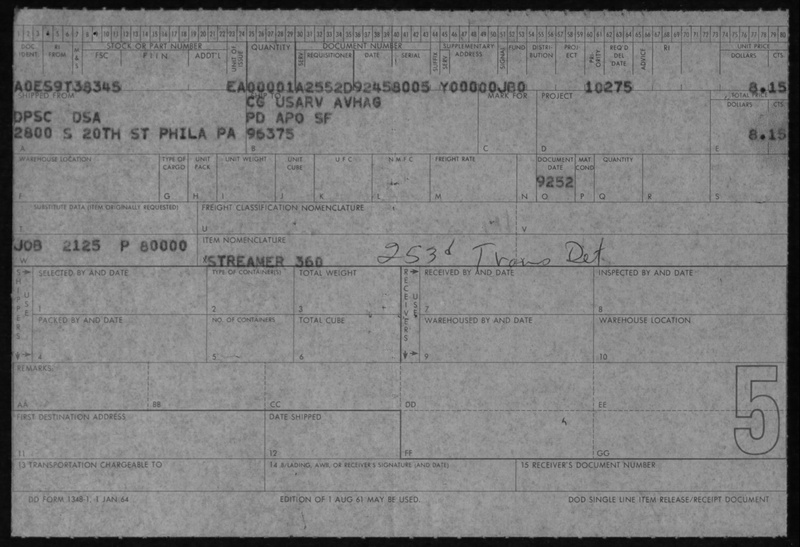 While on inactive status, the Company was designated the 165th Quartermaster Truck Company on 10 December 1943 then re-designated as the 165th Transportation Corps Truck Company on 1 August 1946. In 1952, the Army built its first LCU 1466s. 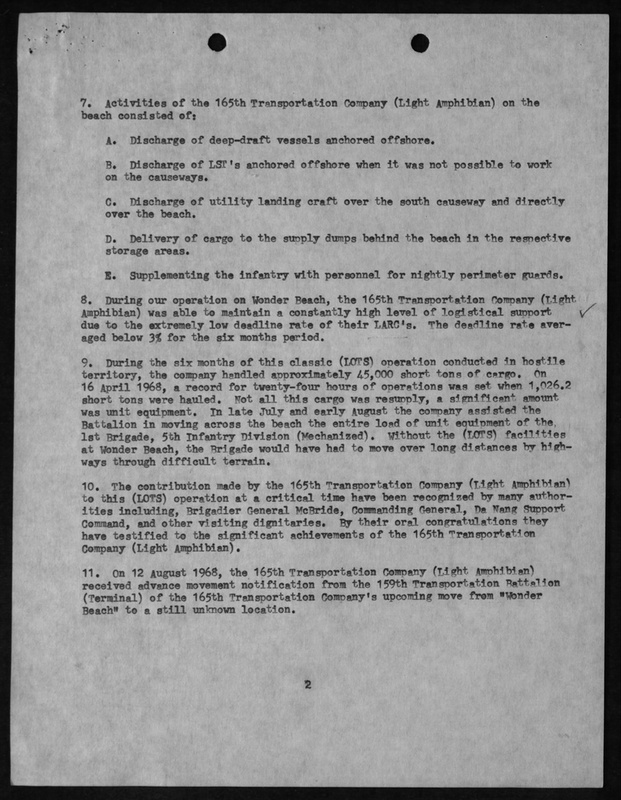 The 165th Transportation Corps Company was re-designated the 165th Transportation Company on 11 June 1954. 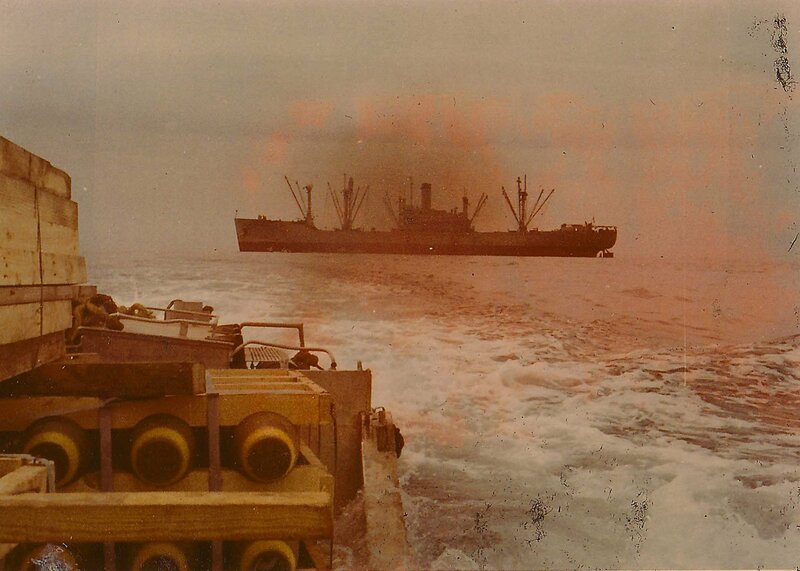 On 15 July 1954, the 165th Transportation Company was activated at Fort Eustis, Virginia, as one of two heavy boat companies of the 159th Transportation Battalion (Boat). On 25 September 1956, it was inactivated at Fort Eustis, Virginia. The 165th Transportation Company (Light Amphibian) was activated at Fort Story, Virginia, on 1 June 1966. The 253rd Transportation Company (Amphibious Maintenance Direct Support) was attached to the 165th Transportation Company (Light Amphibian). In December 1966, the 165th Transportation Company (Light Amphibian) and the 253rd Transportation Company (Amphibious Maintenance Direct Support) rail loaded to Oakland, California, shipped out to Cam Ranh Bay, Vietnam. In April 1967, half of the 165th Transportation Company (Light Amphibian) combined with personnel from the 347th Transportation Company (Light Amphibian) moved to Thailand and were attached to the 499th Transportation Battalion (Terminal) at Sattahip. The 165th Transportation Company (Light Amphibian) set up company operations in tents on the beach near Utapao Royal Thai Naval Base where the unit conducted ship-to-shore lighterage in support of the US Air Force, at Sattahip, Thailand where ships usually anchored approximately one and a half miles off shore. In late 1967, US Army engineers built and positioned a Delong Pier for the ships to dock thereby reducing or completely eliminating the need for the 165th Transportation Company (Light Amphibian) LARC Vs.
On 18 March 1968, personnel from the 165th Transportation Company (Light Amphibian) combined with personnel from the 347th Transportation Company (Light Amphibian) sailed from Thailand and arrived at Thon My Thuy, Vietnam on 2 Mar 1968 and joined the remainder of the unit assigned to the 159th Transportation Battalion (Terminal) known as Sunders Wonders provided command and control for the LOTS operation at Wunder Beach and was the most significant LOTS operations ever conducted during the Vietnam War. The beaches all along I Corps had too shallow a gradient for landing craft to drop ramp on dry shore. Therefore, only amphibious vehicles from the 165th Transportation Company (Amphibious Light) and Provisional BARC Companies could conduct the ship-to-shore lighterage. Immediately upon arrival in country Vietnam, the personnel of the unit were faced with precarious task of forging a base of operations on an isolated beach deep within hostile territory. Although subjected to constant enemy harassment, they worked on a twenty-four hour basis to establish a defensive perimeter and adequate living and working conditions in the remarkably short period of four days. The LOTS operation supported the 1st Cavalry Division during Operations PEGAUS and DELAWARE to break the siege of Khe Sanh and drive the NVA out of the A Shau Valley. 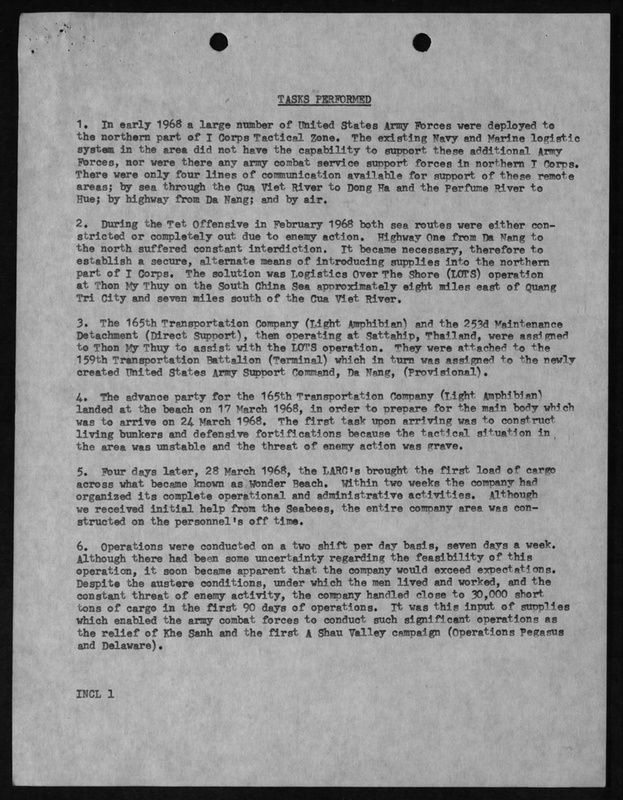 Although the 165th Transportation Company (Light Amphibian) and their fleet of 25 LARC Vs were subjected to constant attacks from enemy fire. The LOTS operation at Wunder Beach, near Quang Tri, fortunately provided MACV with the additional tonnage needed to conduct its counter-offensive to relieve Khe Sanh and drive the NVA out of I Corps Zone. This was only possible due to the skill and efficiency with which men at Wunder Beach moved cargo from ship-to-shore and inland. A typhoon closed down the operation in September. Thus, they far exceeded the expectations of MACV skeptics and delivered the means for victory. Realizing the importance of civic actions to the ultimate success of the war effort, the men of the company organized a vigorous assistance and transportation program to replenish vitally needed food supplies for the isolated island of Bai Lue. 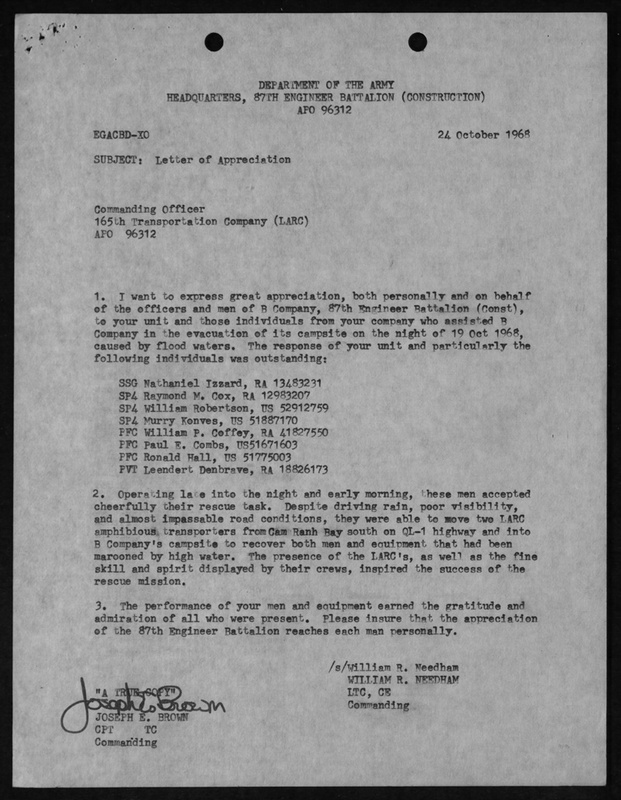 The 165th Transportation Company (Light Amphibian) and 253rd Transportation Company (Amphibious Maintenance Direct Support) were awarded the Meritorious Unit Commendation on 3 May 1969 for their work at Wunder Beach during the period 21 March 1968 to 26 September 1968. On 19 October 1968 an urgent call came in to assist B Company, 87th Engineer Battalion in the evacuation of their campsite that became stranded by high waters. The crews of two amphibious LARC Vs were dispatched south of Cam Ranh Bay on QL-1 highway and successfully completed their mission and were recognized by a Letter of Appreciation from the Battalion Commander of the 87th Engineer Battalion. Those recognized were SSG Nathaniel Issard, SP4 Raymond M. Cox, SP4 William Robertson, SP4 Murry Konves, PFC William F. Coffey, PFC Paul K. Combs, PFC Ronald Hall, and PVT Leendert Dan Brave. The 165th Transportation Company (Light Amphibian) was inactivated in Thailand on 1 November 1968. The company continued to operate until all personnel had become reassigned on 22 Jan 1969. I spent Christmas 1967 at home in West Virginia, then immediately flew to Thailand. I am not your usual Trucker counterpart, but thanks for including me and my unit in your group. My unit was the 165th Transportation Company (Light Amphibious). Our vehicles were LARC's (aluminum boats with wheels). I don't know if any of you ever heard of us, but we were assigned to the 499th. We lived in hooches the final end of the B-52 runway at U-Tapao Air Force Base (very quiet place) a hundred miles or so south of Bangkok. Army guys playing Navy at an Air Force Base - "ain't" that a kick. When we left Thailand in February 1968, we moved to the DMZ in Vietnam. I'm happy that you made it home and wish you and yours the best Christmas ever. If anyone knew of us, please drop me a line. Hi Clarence D. Moore fellow 165th view following web site and wish you a belated Merry Christams and a good New Year for you and your family. 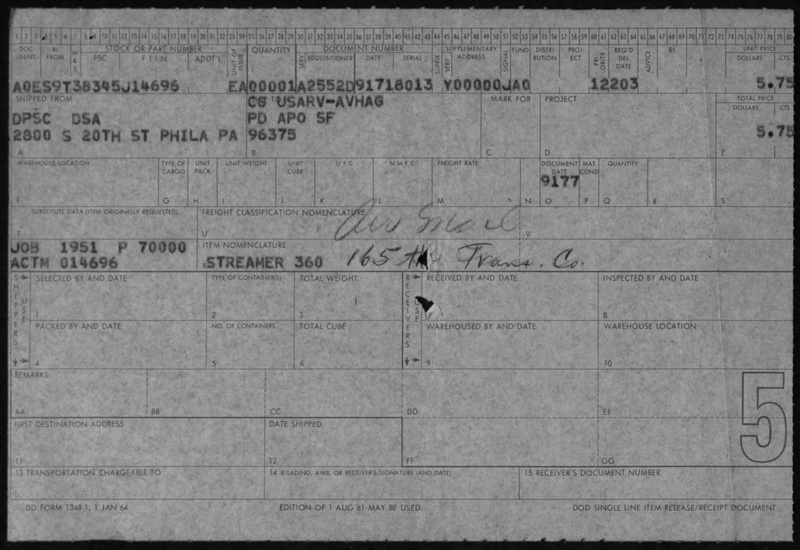 Hi again, the 519th shows you on their roster as being in the 165th from 66 to 68? Is this correct-where you with me at the start of the 165th at Ft Story? 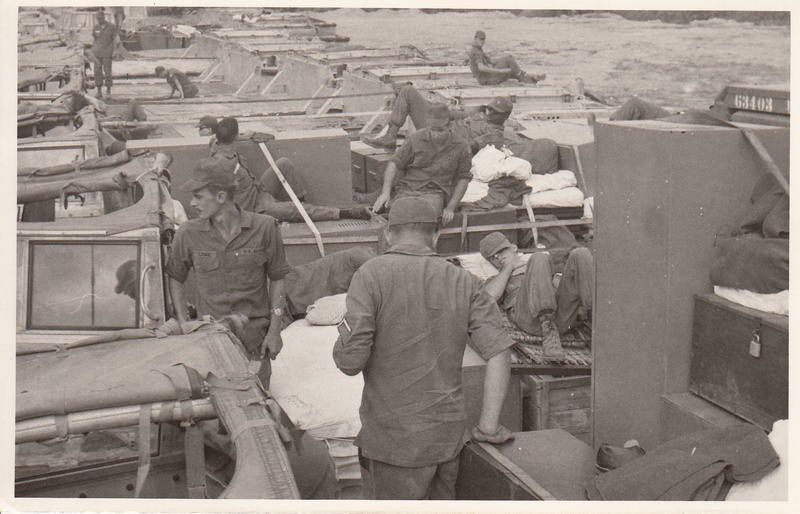 The Army's 165th Light Amphibious Company LARC V) was living in tents with wood plank floors at UTAPAO on the Gulf of Siam. Before the deep water port opened/expanded the 165th and their LARC V amphibious vehicles (Similar to WWII Ducks) unloaded 500 and 750 lbs bombs from Victory ships anchored approx 1 mile off shore. 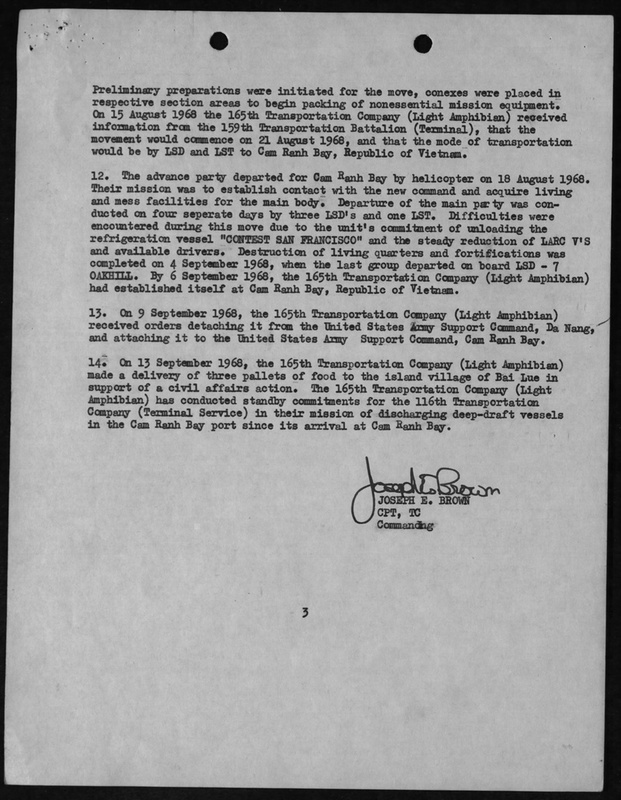 The LARC V's then drove onto land and hauled the bomb pallets directly to the UTAPAO ammo dump. Agent Orange - Anyone who went to the Outdoor Movie Screen (Located at the end of the Utapao runway going out to the Gulf) was dead on one perimeter. Any Army or Air Force personnel on the base probably attended lots of these movies. About March 15th 1968 the 165th and 253rd maintenance companies were moved by ARMY command from UTAPAO Thailand to a location approx 12 Miles below the DMZ in Quang Tri province So Vietnam at Thon My Thuy. Thousands of troops were landed WWII style on a beach named "Wunder Beach". The task at hand was to build up massive supplies for large offensive action in Quang Tri Province. The combined military forces of both So Vietnam and the US grew to approx 100,000 personal in Quang Tri province. Khe Sahn was isolated and the major cities of Dong Ha and Quang Tri were constant targets. Some time between April 6-8, 1968 the siege of Khe Sahn was lifted. 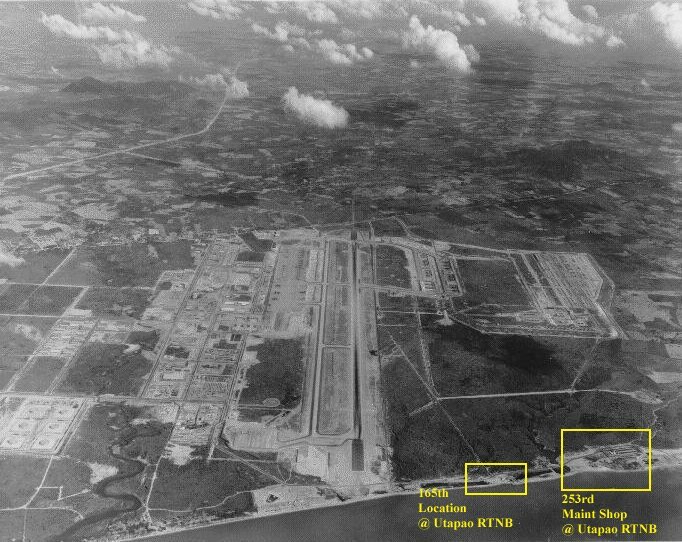 The 165th and 253rd were moved again in Sept 1968 to Cam Ranh Bay. By Jan 1969 the units had been gradually broken up as people either rotated to CONUS or were reassigned to other units in So Vietnam. 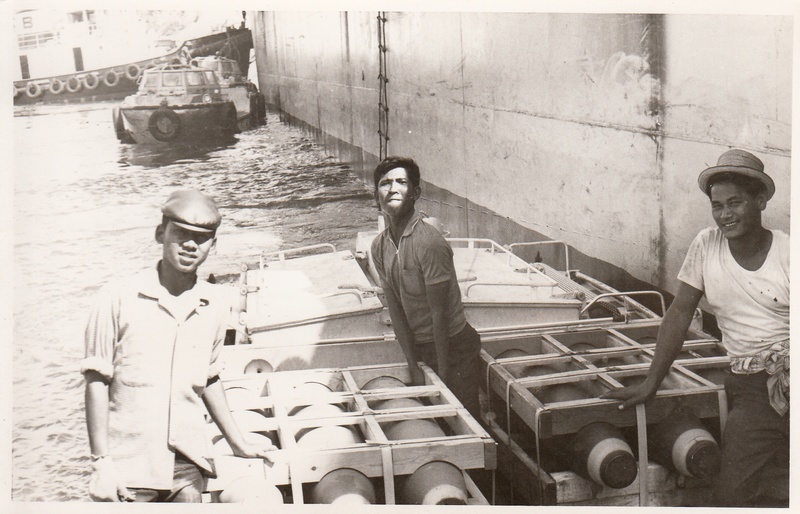 Most personnel being water rats were assigned to river patrol units in and around Saigon. If there are any 165th/253rd people out there reading the 519th e-mails my name is Les Bowers, <ldb1947@(TAT)yahoo.com> I arrived at the 165th in Dec 1967 via Sattahip (The Army personnel guys at Sattahip informed me I was getting a plum assignment and would be replacing William Barksdale in the orderly room at the 165th). One smiling E-5 mentioned "Oh, by the way Bowers you'll be on a B-52 Air Base, living in tents and have full use of 6-hole outhouse". I stayed with the 165th thru Jan 1969. I rotated out of Vietnam back to CONUS in June 1969. Unfortunately I wasn't in Thailand long enough to experience more. Here are some of my fond memories of Sattahip - I loved taking a baht bus to Sattahip with a few buddies and eating Prawns at one of the restaurants. The Yak steak and Thai version of Pizza wasn't bad either. The fish market was a wonder for me as it was the first time seeing a hammerhead shark. I don't remember what brand of foreign beer it was but there was one brand that smelled like kerosene. And the Katoys, were they still there in the late 60's / early 70's? I have recently filed a claim for Agent Orange and will share the experience in 3-6 months when my case is reviewed. ARMY E-5 Les Bowers (LB to Friends).